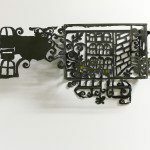 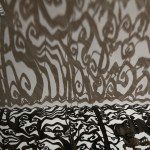 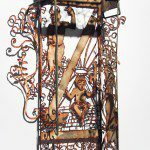 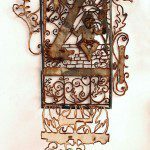 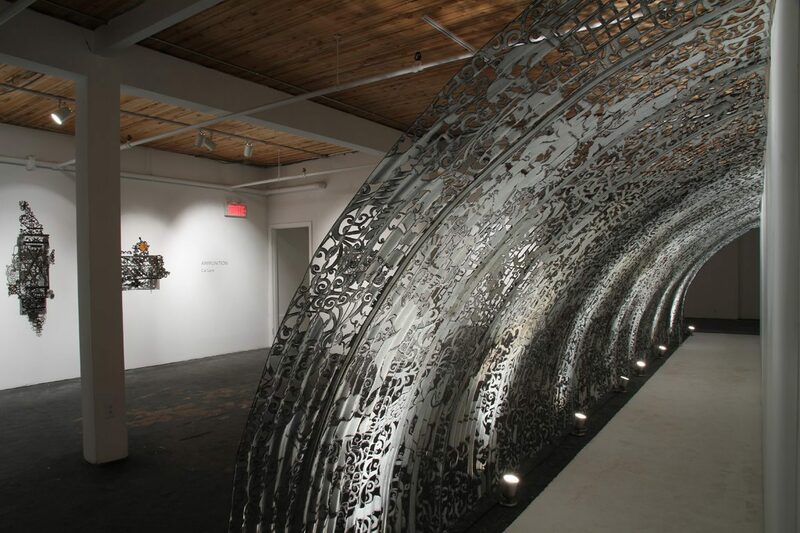 Cal Lane creates stunning works of art with steel and a blowtorch. 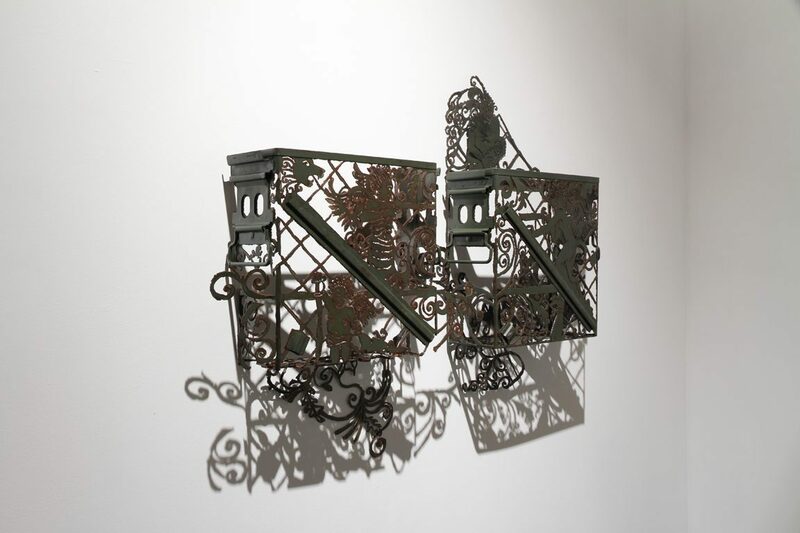 The works in her oeuvre are riveting, creating relationships that straddle the line between ornament and function. 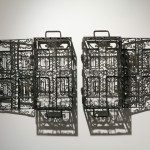 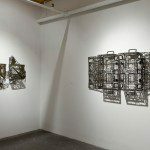 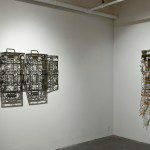 Her current series, Ammunition, contrasts beautiful patterns and imagery with utilitarian objects that include ammunition boxes and sewer pipes. 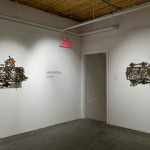 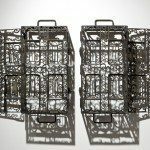 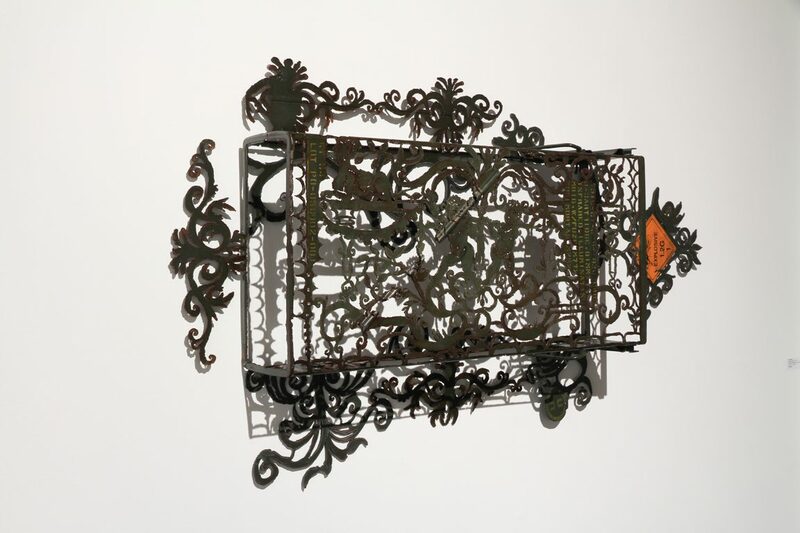 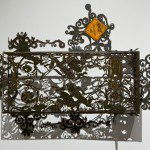 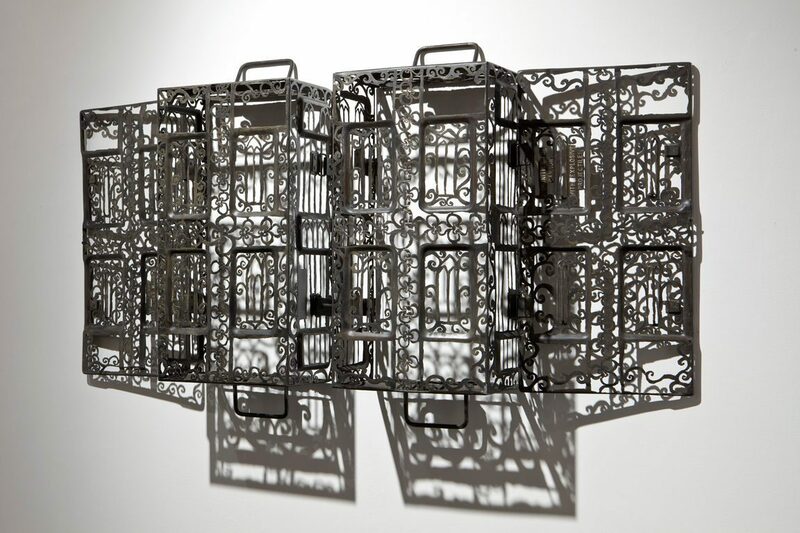 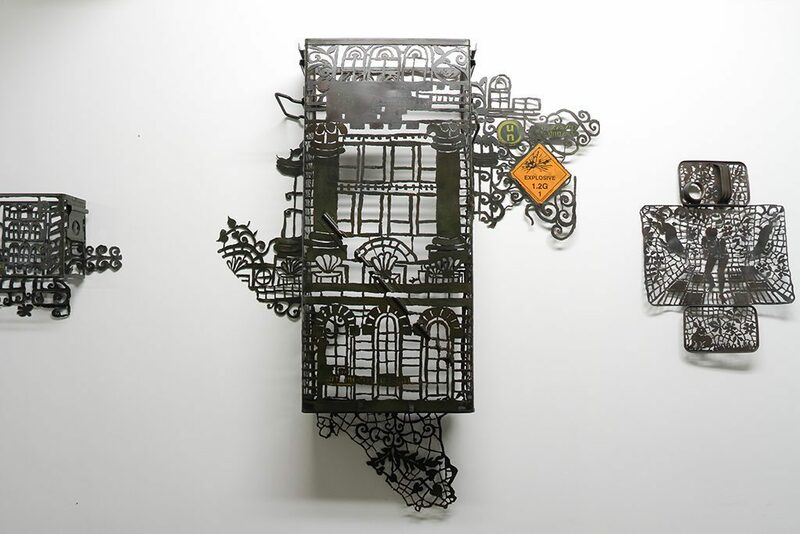 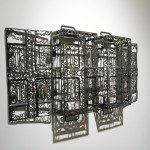 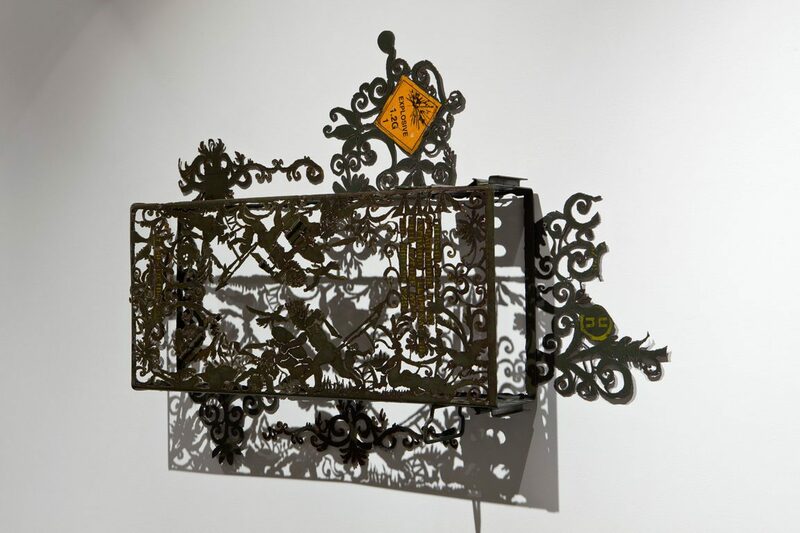 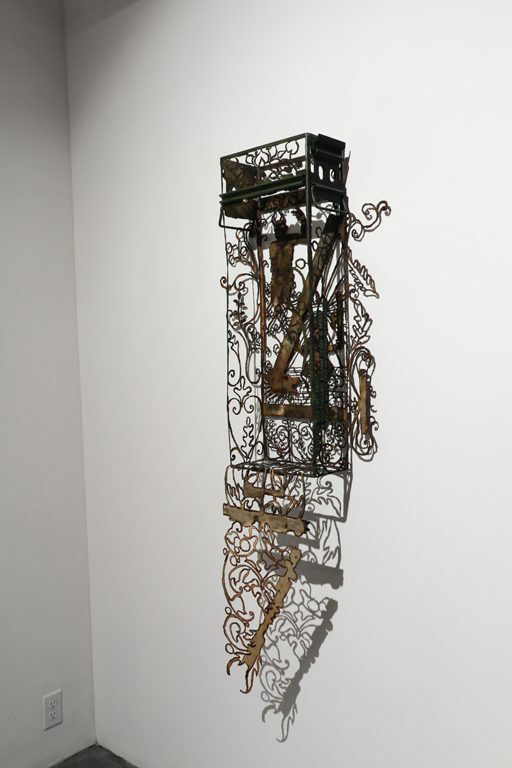 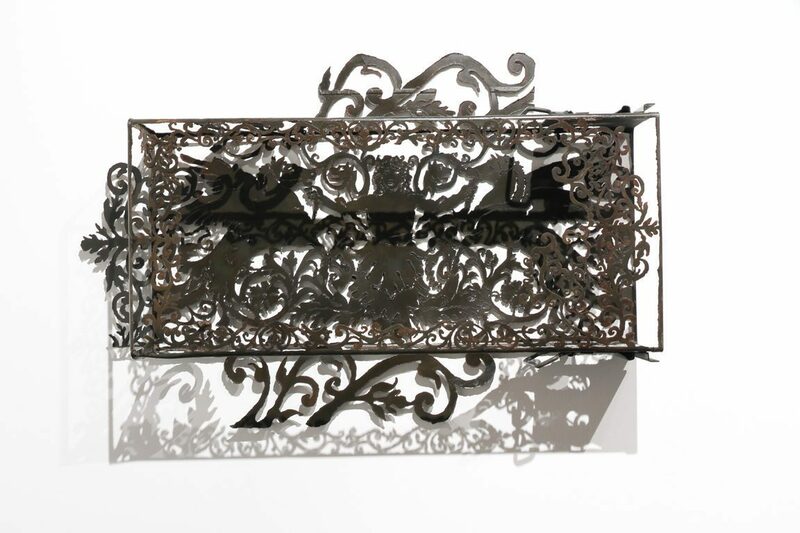 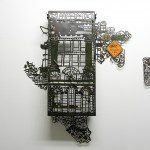 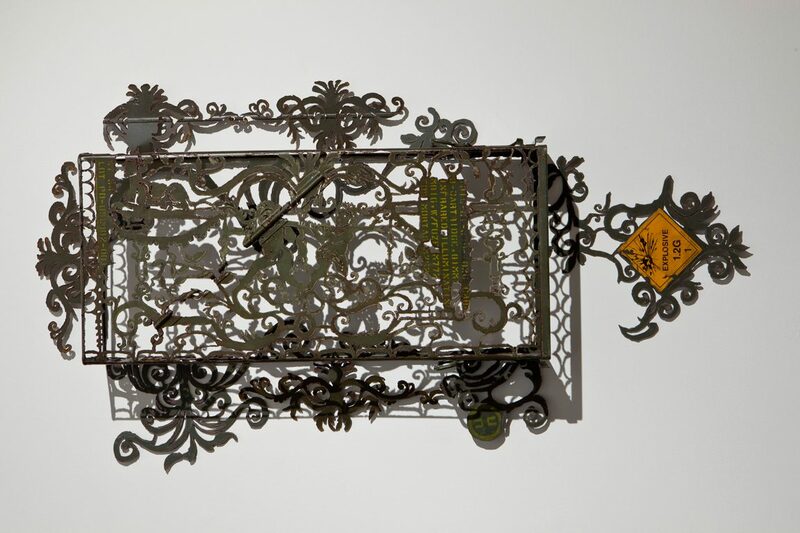 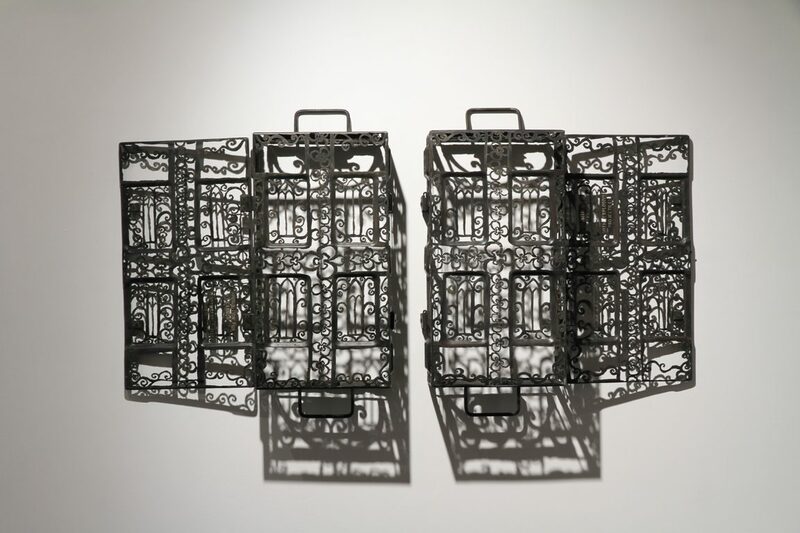 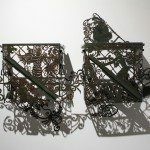 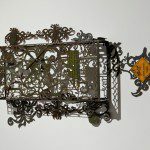 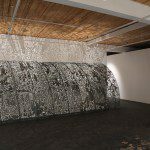 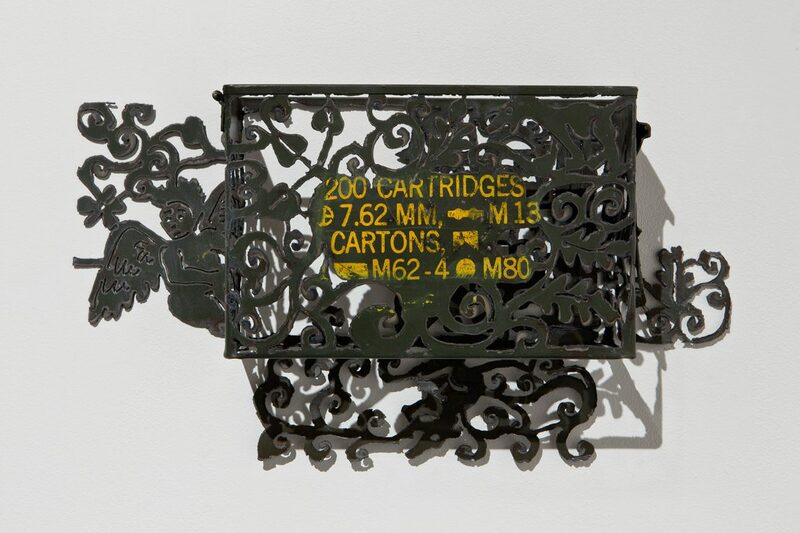 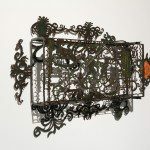 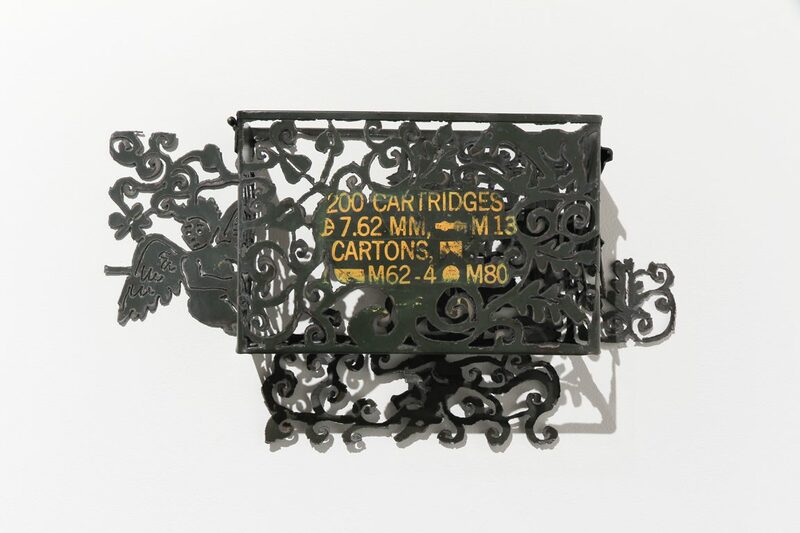 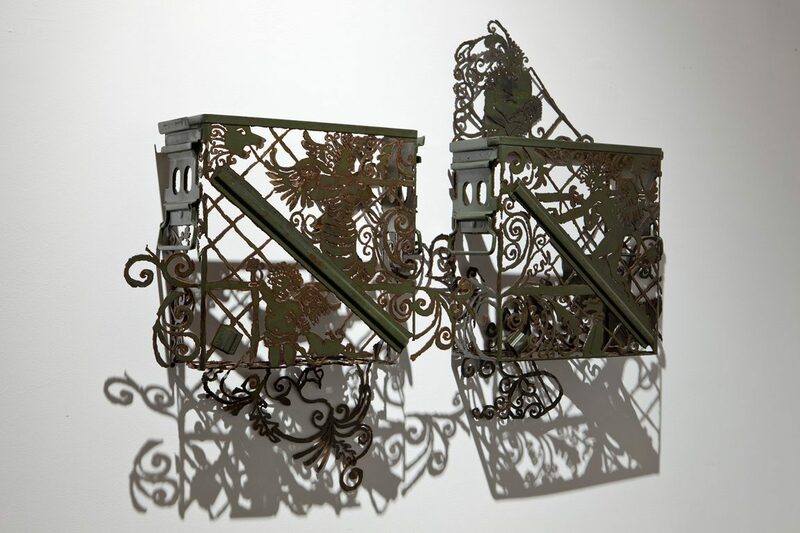 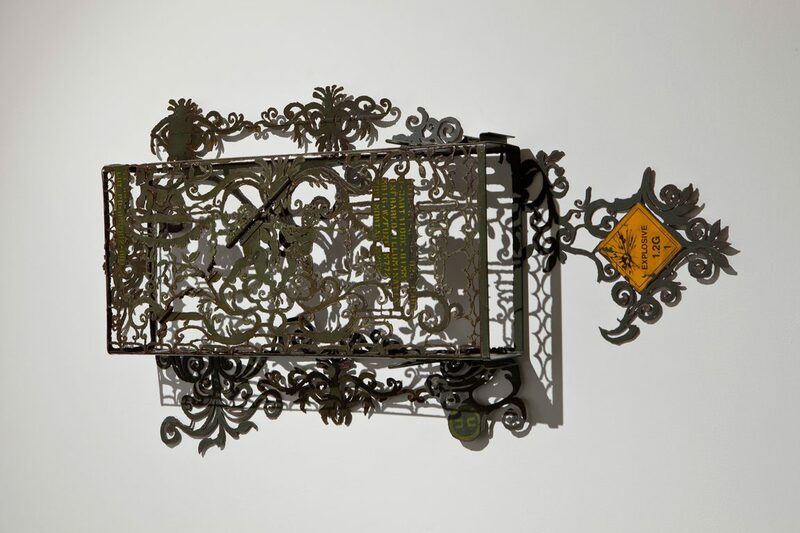 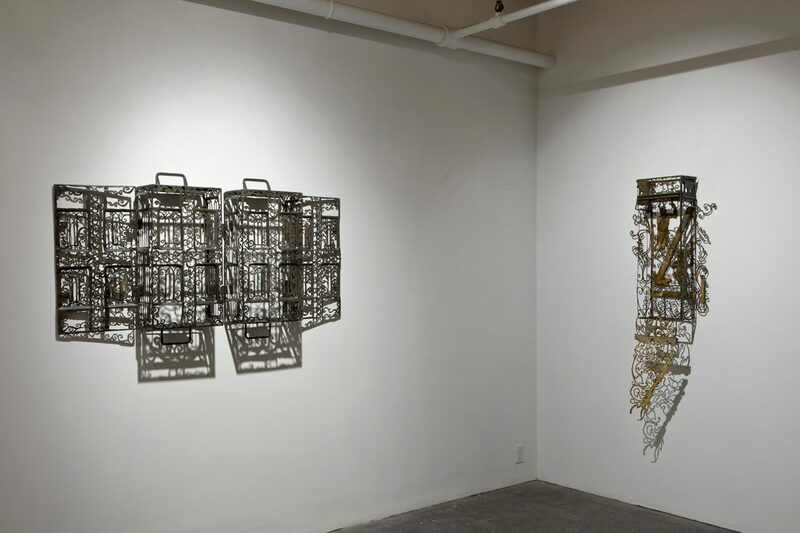 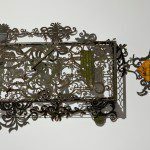 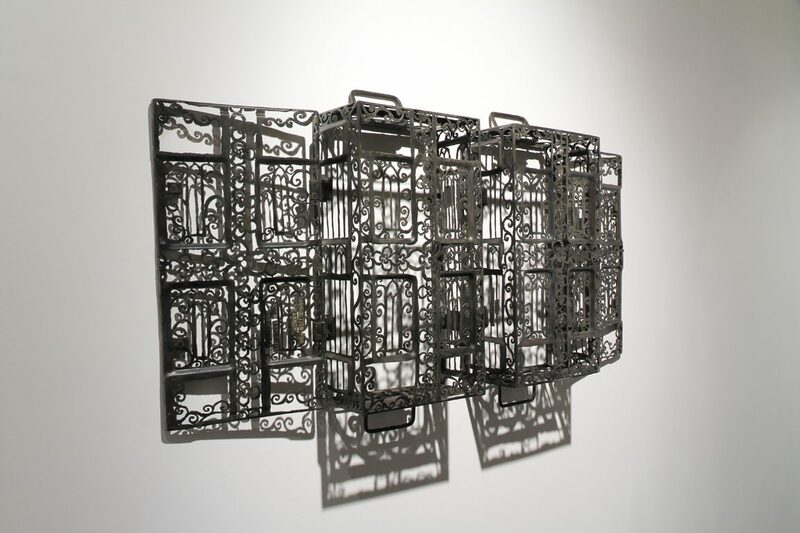 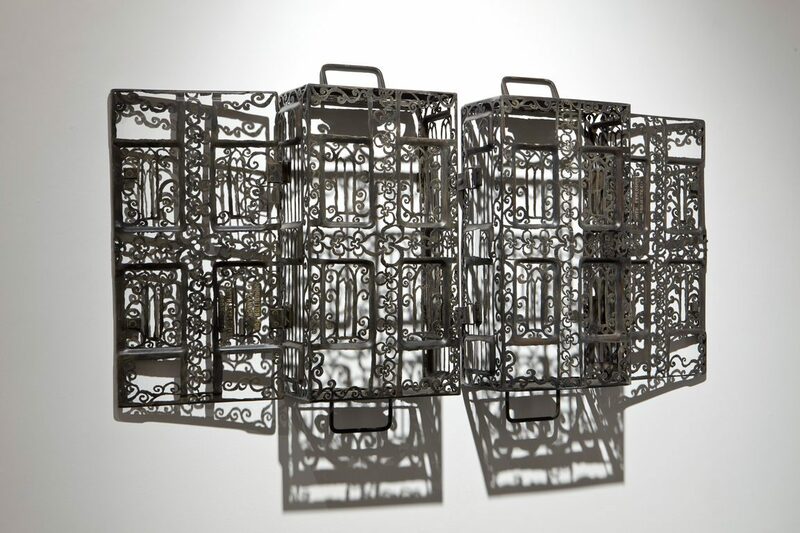 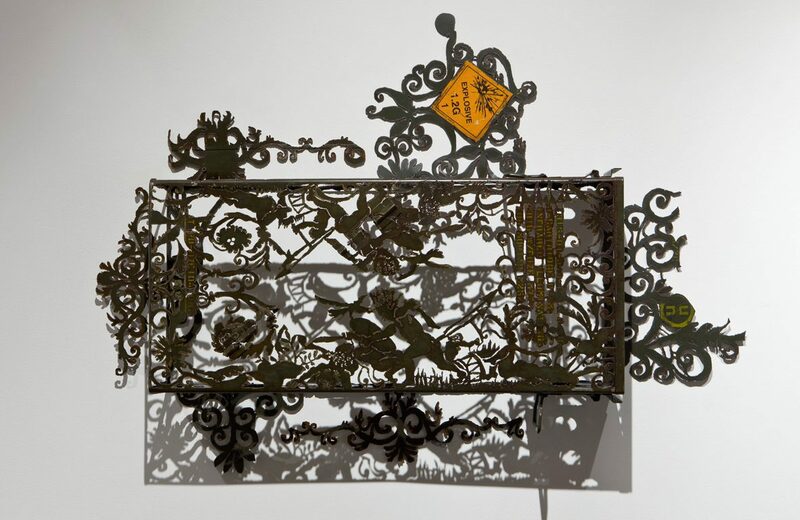 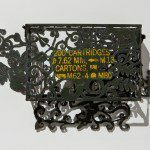 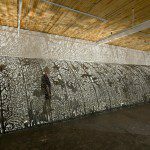 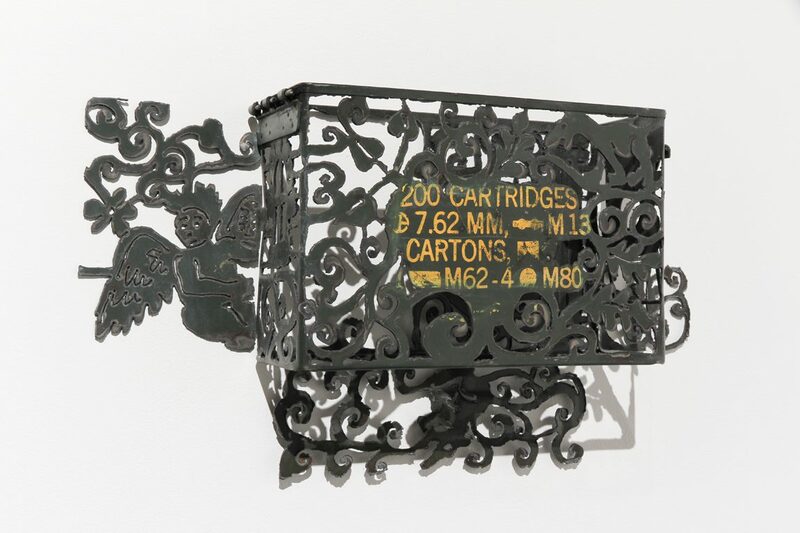 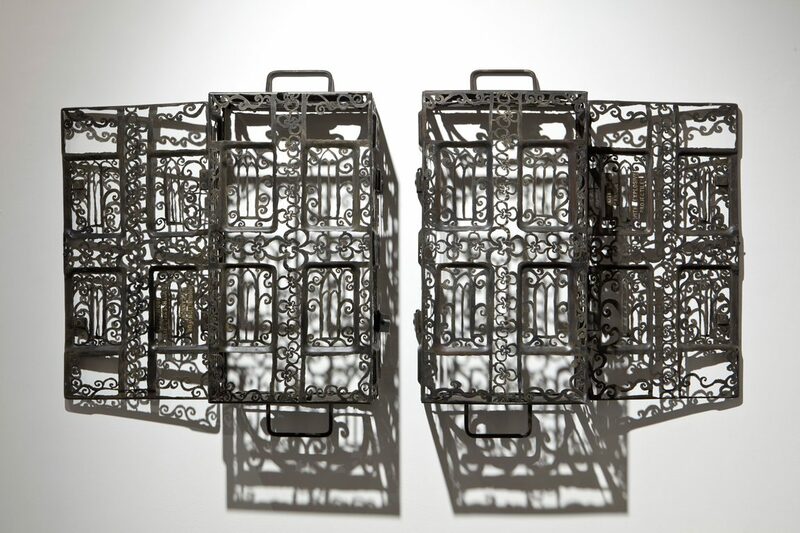 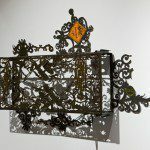 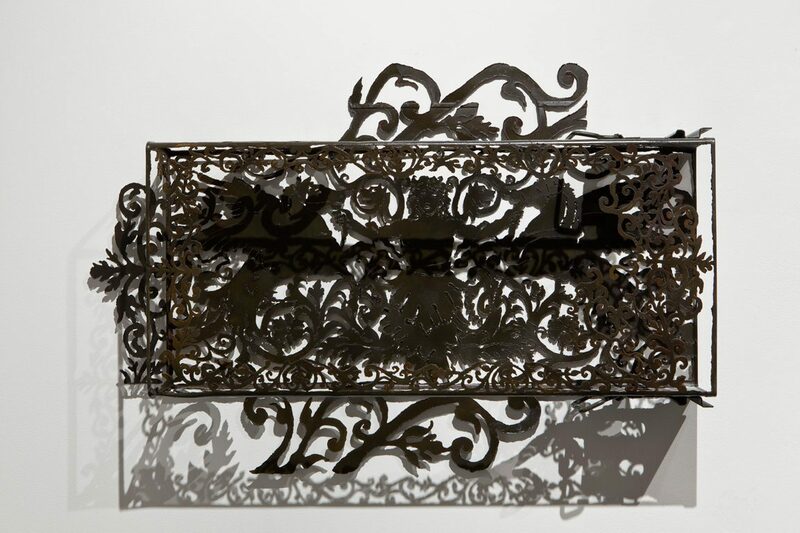 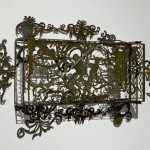 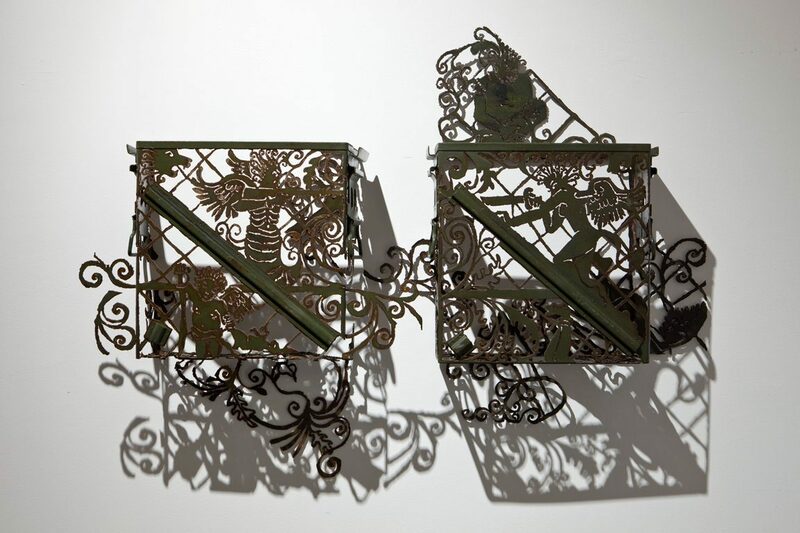 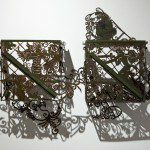 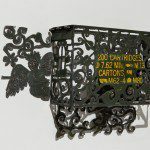 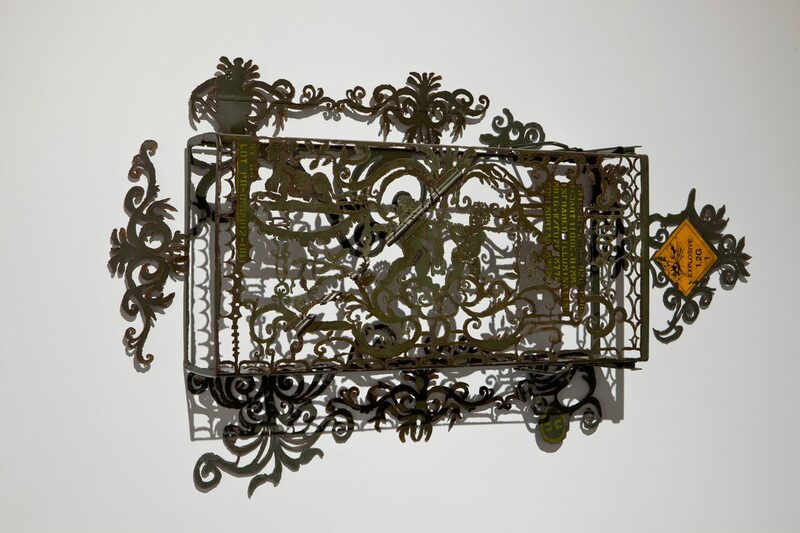 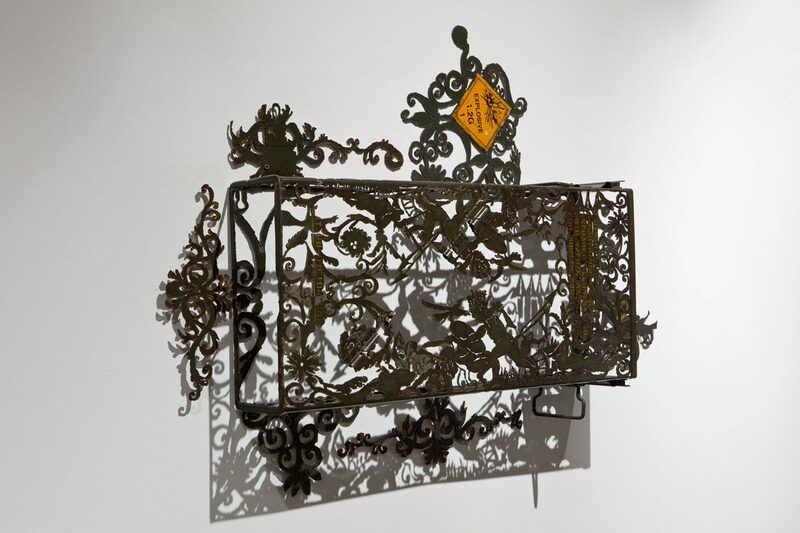 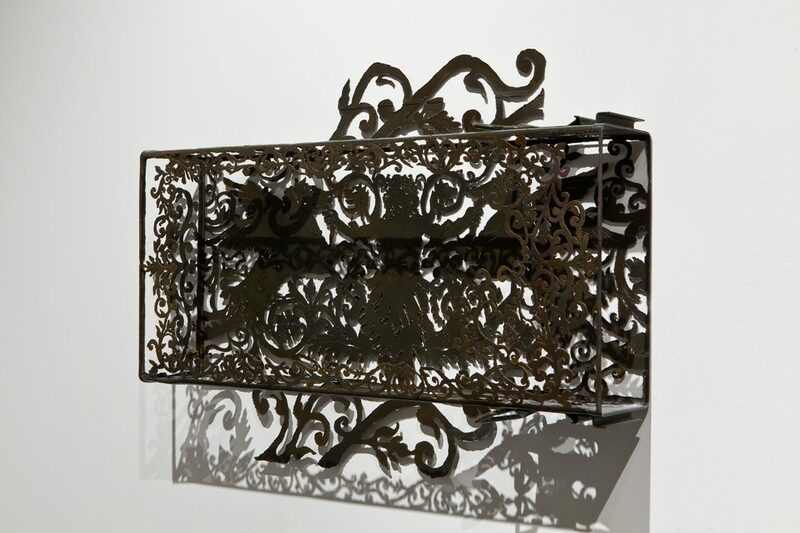 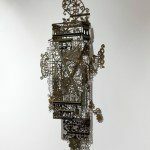 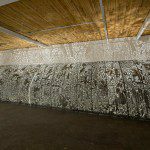 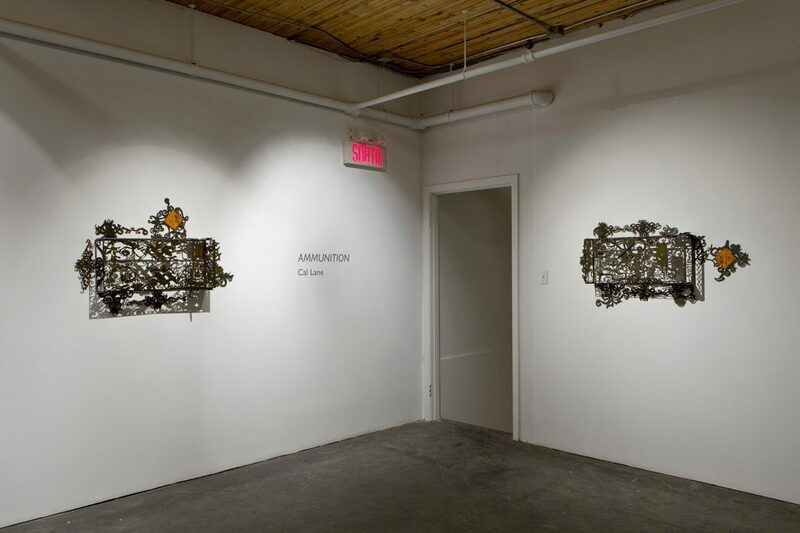 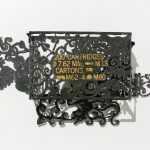 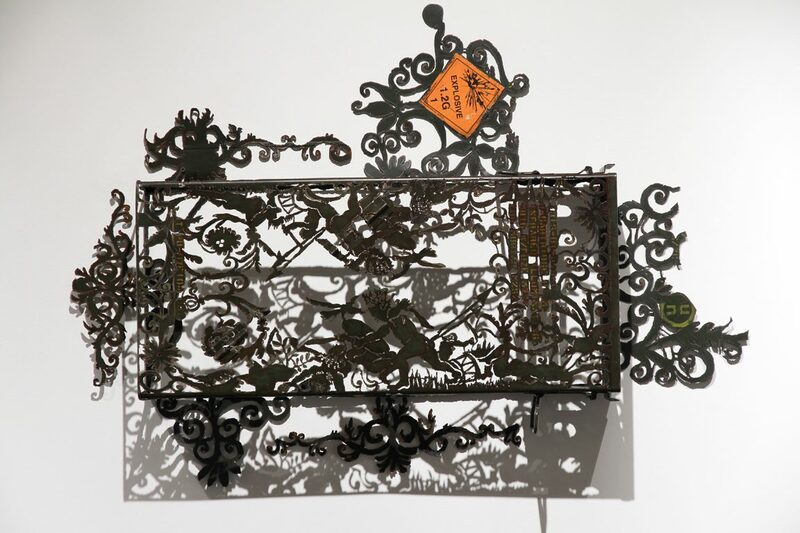 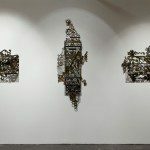 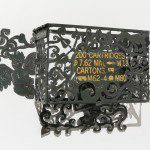 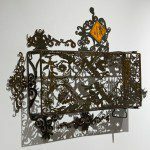 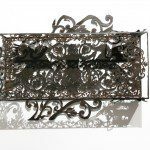 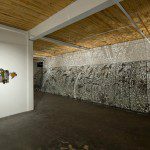 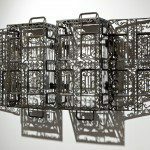 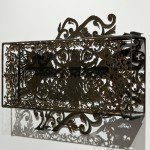 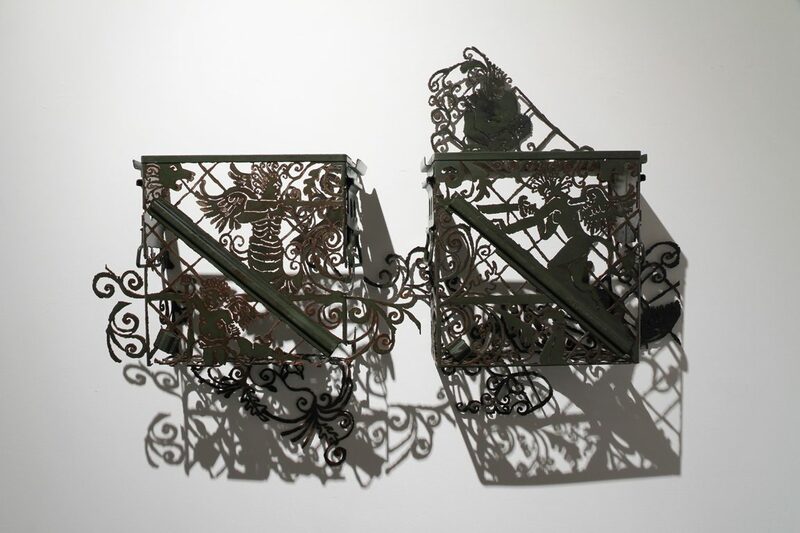 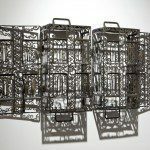 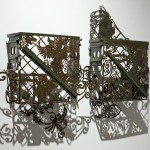 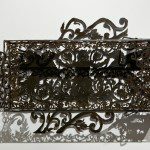 Ammo Box (2011) is comprised of a cut steel ammunition box with intricately detailed patterns reminiscent of religious imagery and lace. 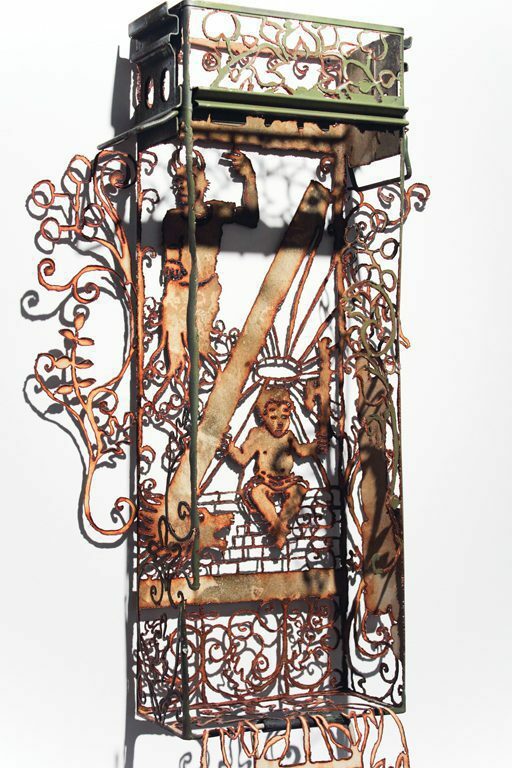 The viewer is invited into the work, in composition of an altarpiece. 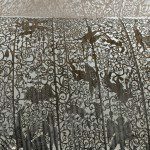 The lace-like pattern creates a visceral desire to touch the delicacy of the lace while the cold metal materials simultaneously discourage this desire. 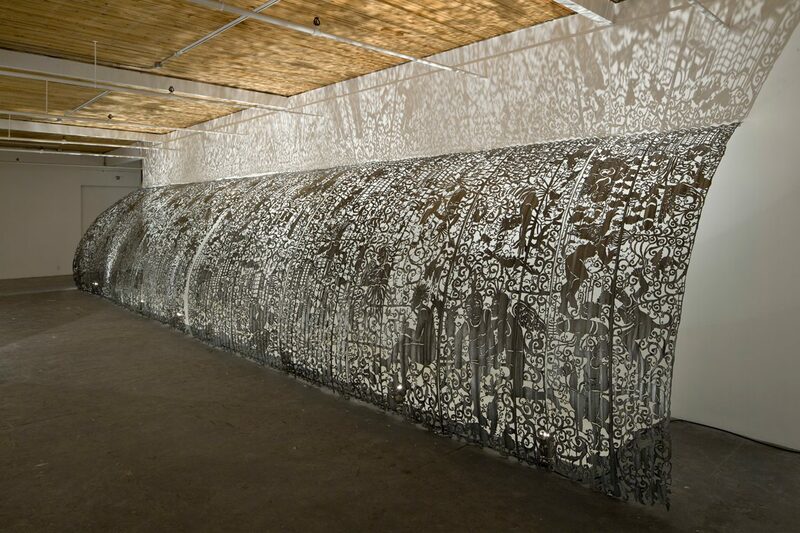 Despite this conflict, it is difficult to turn away from the delicate and mesmerizing nature of this work. 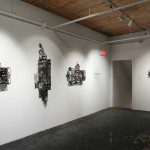 Lane uses materials equated with war and strife, materials unfamiliar to the day to day lives of so many, but familiar to so many others, and visually softens them. 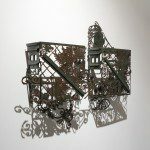 She creates a visual harmony by providing viewers with the comfort of beauty, making the previous unfamiliar materials familiar. 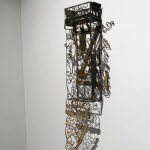 This harmony creates a conflict within the viewer when faced with the uneasy realization there is an underlying connotation of unequal relationships. 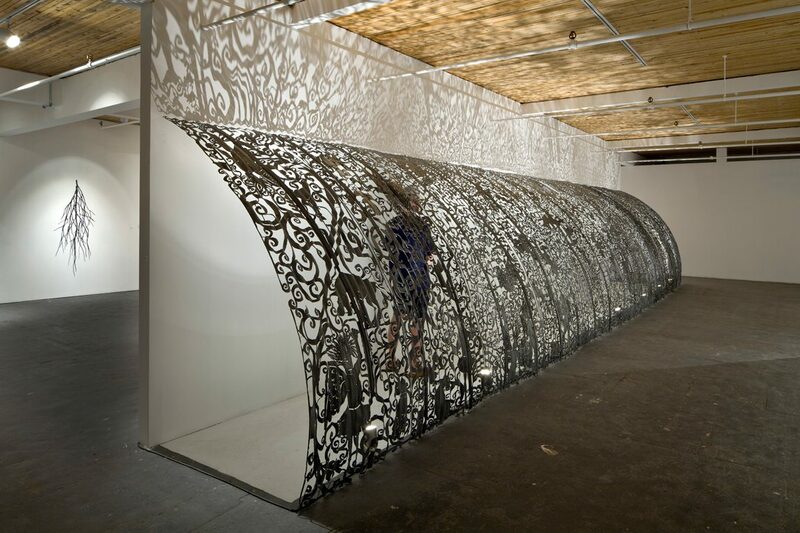 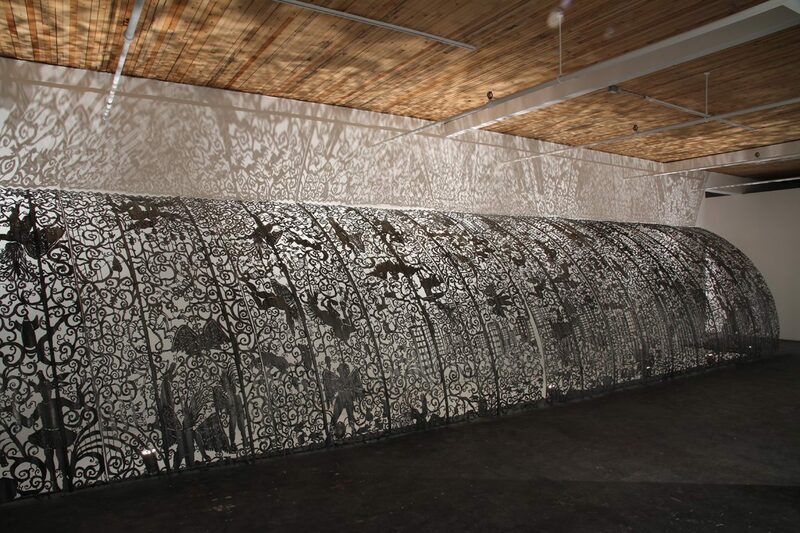 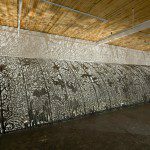 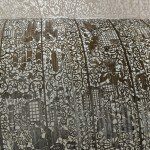 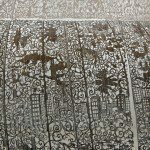 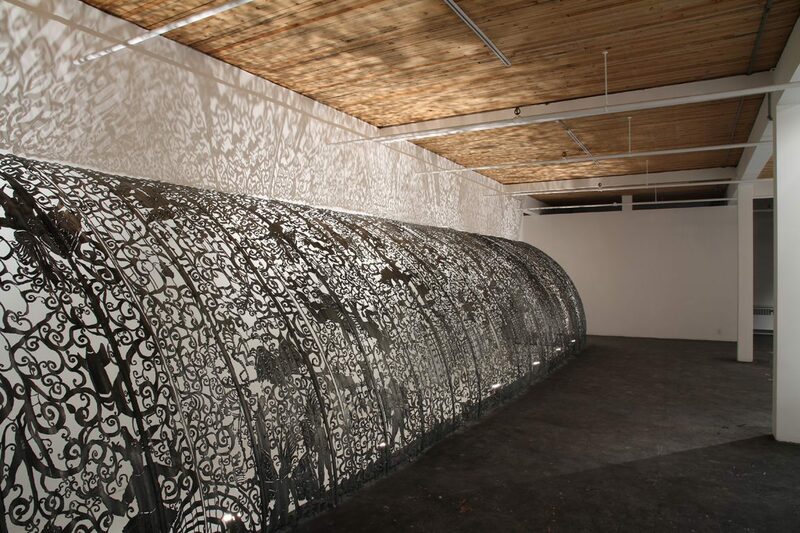 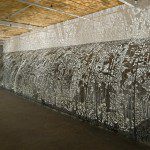 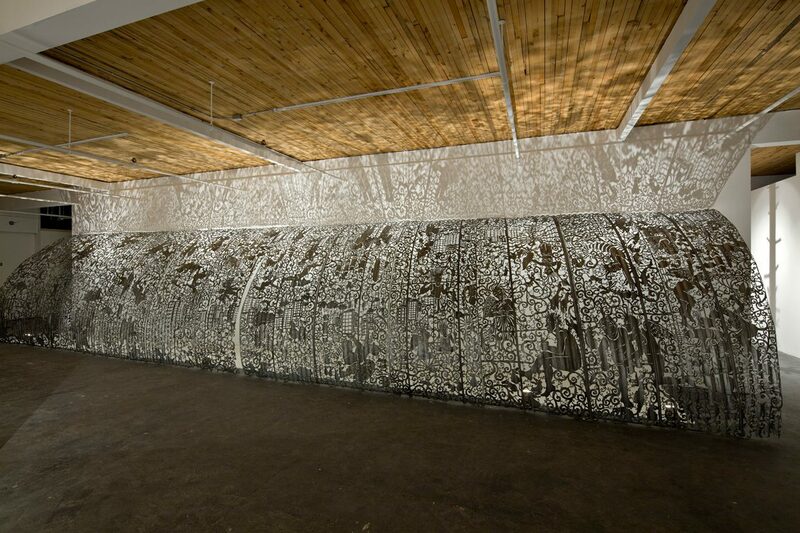 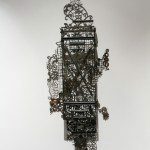 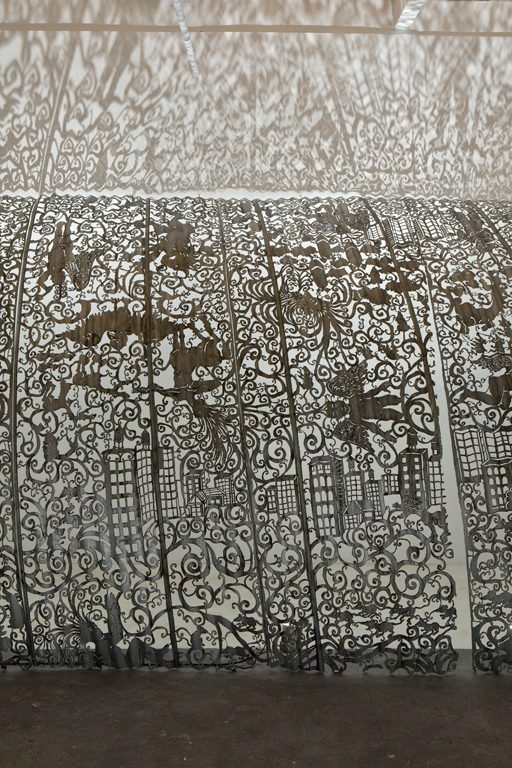 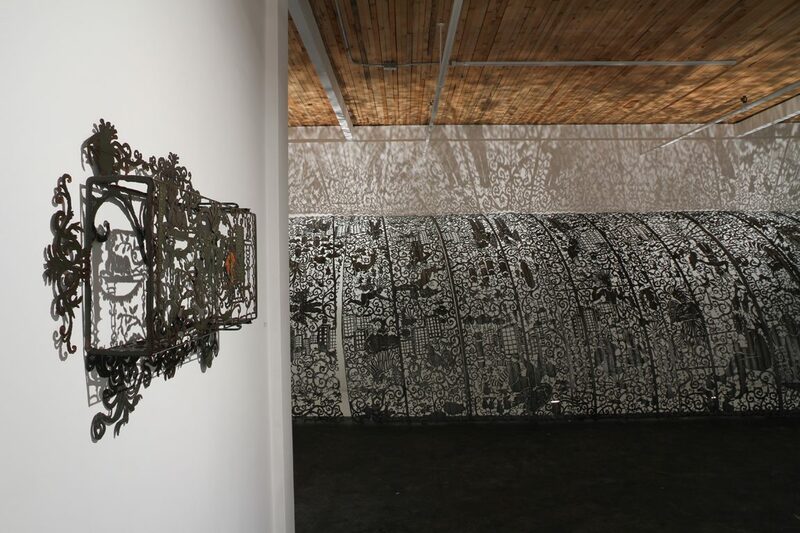 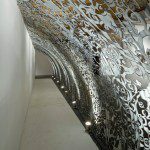 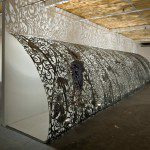 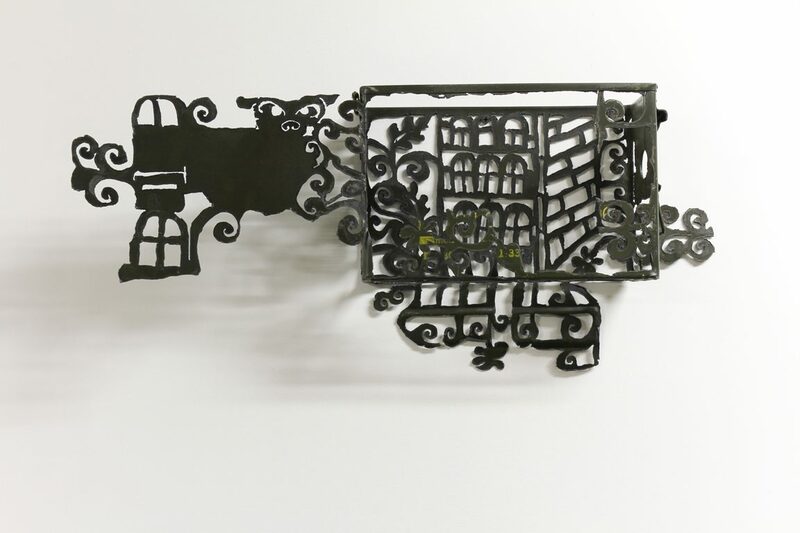 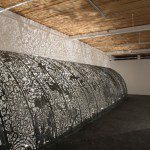 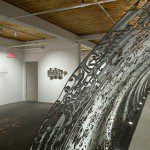 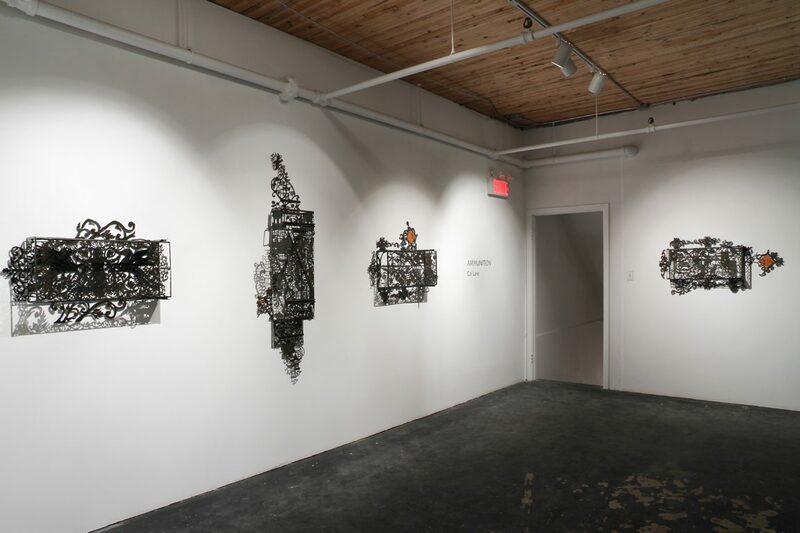 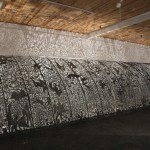 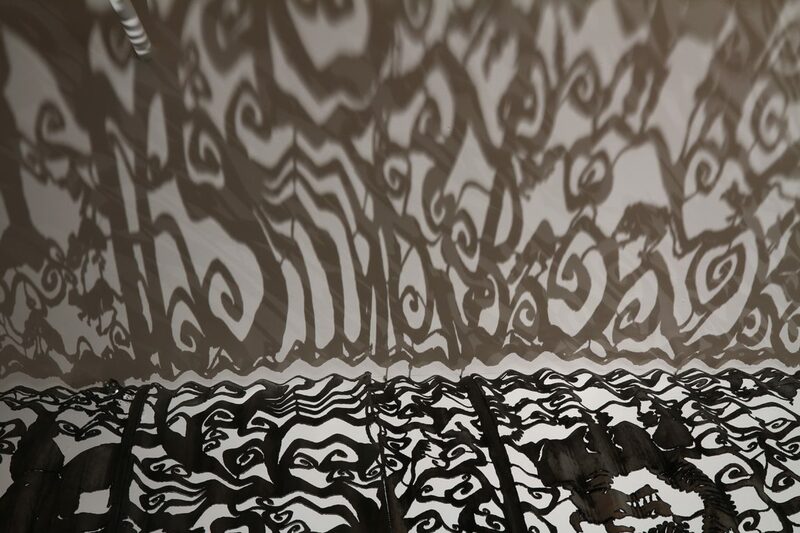 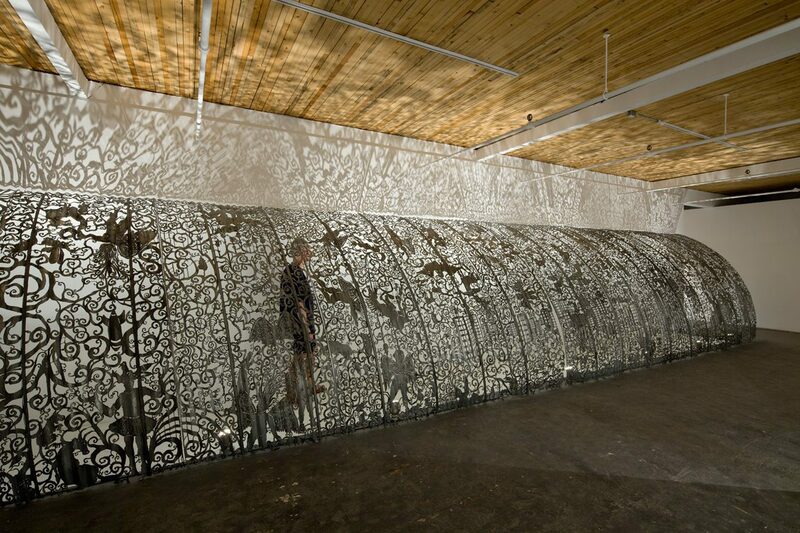 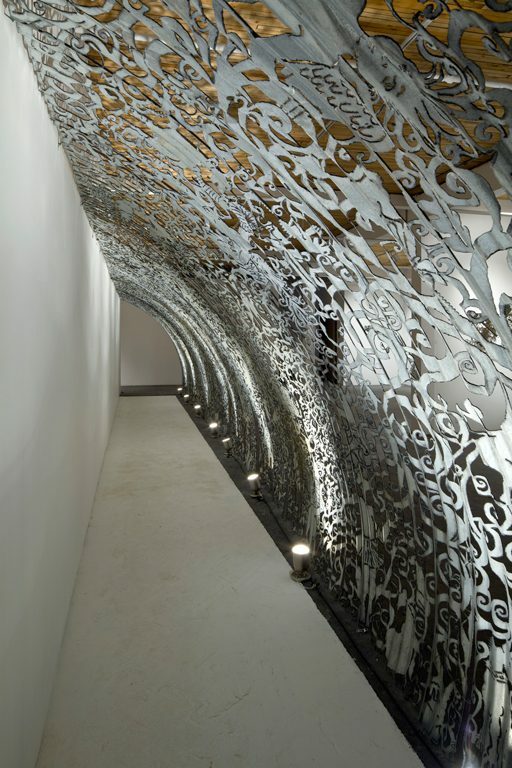 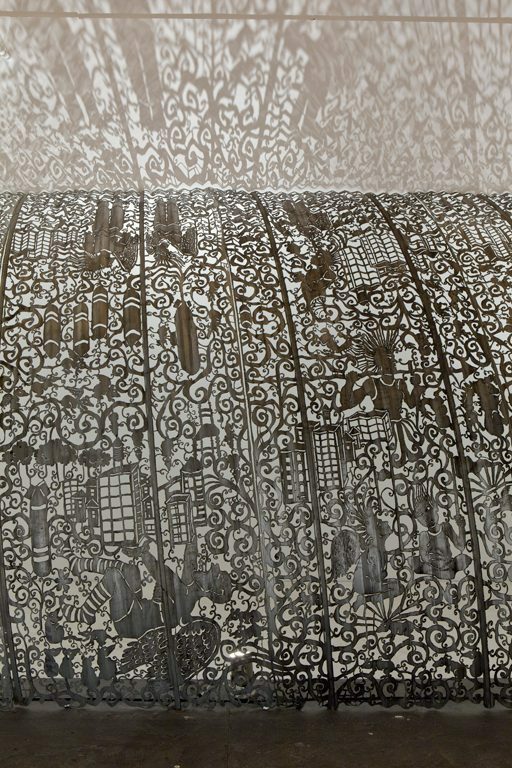 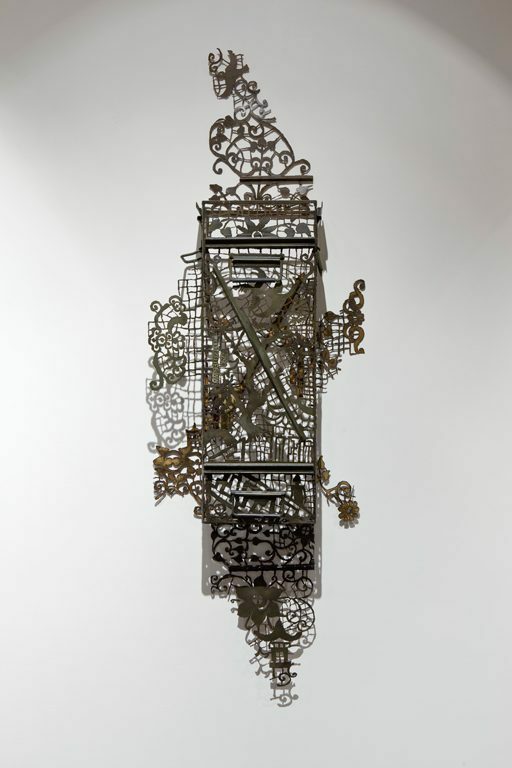 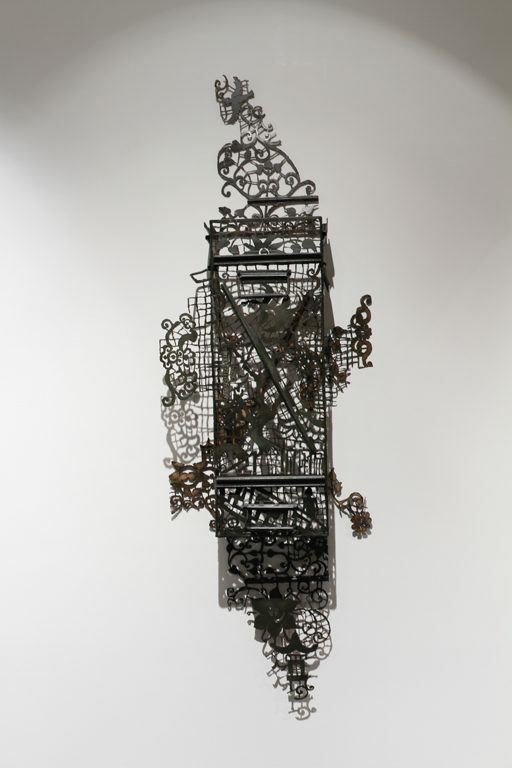 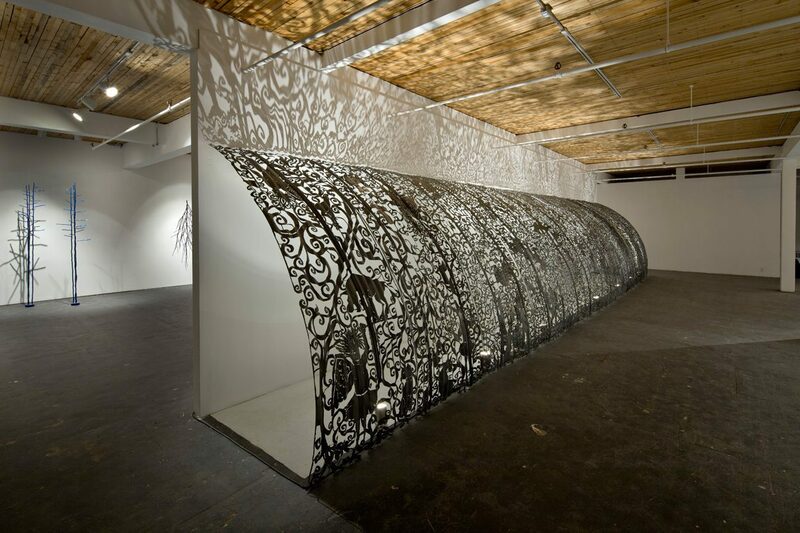 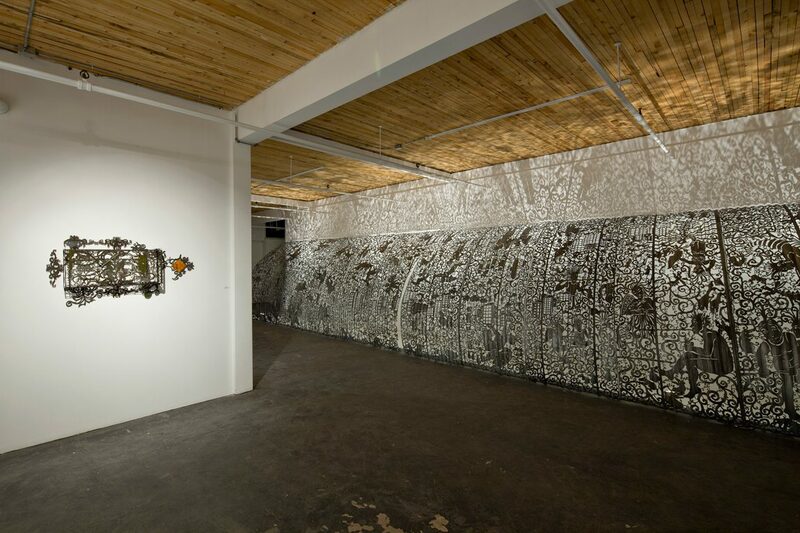 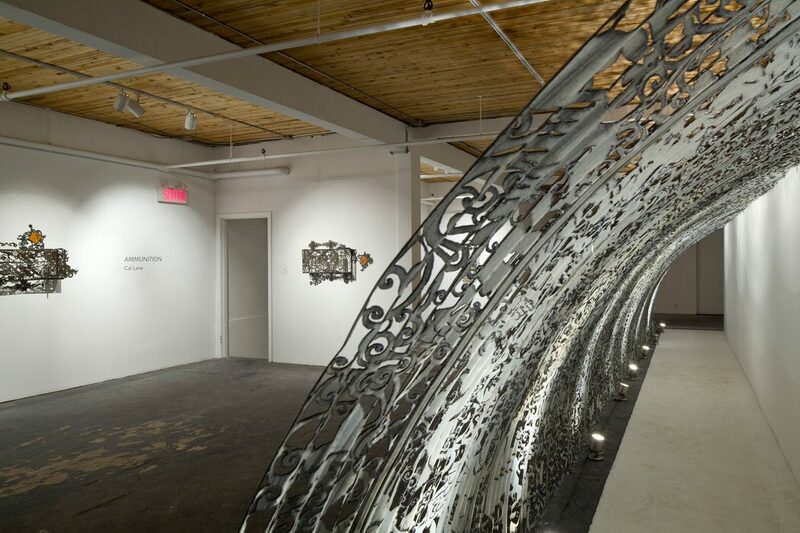 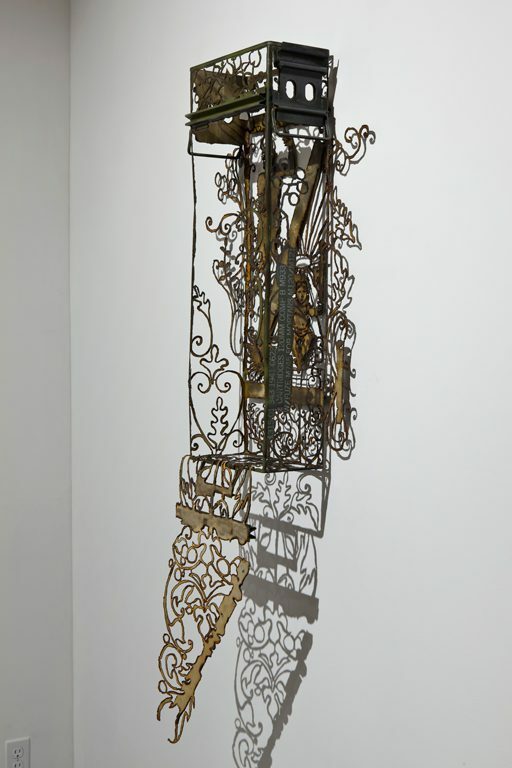 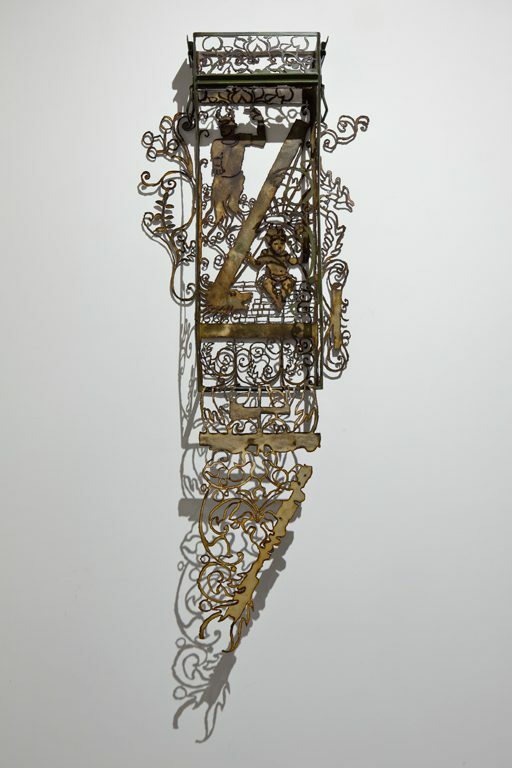 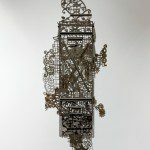 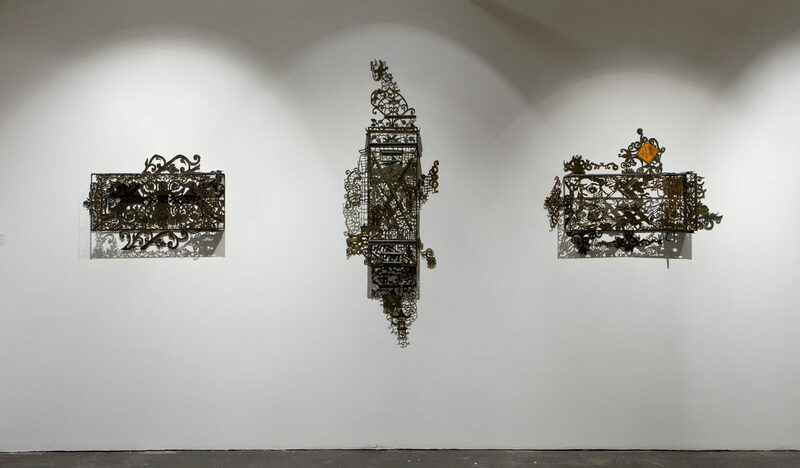 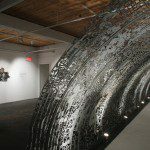 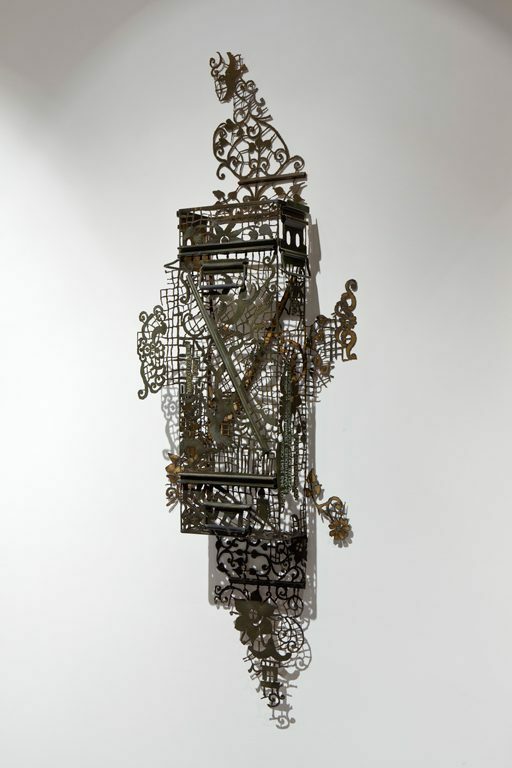 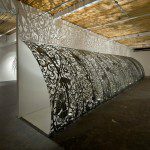 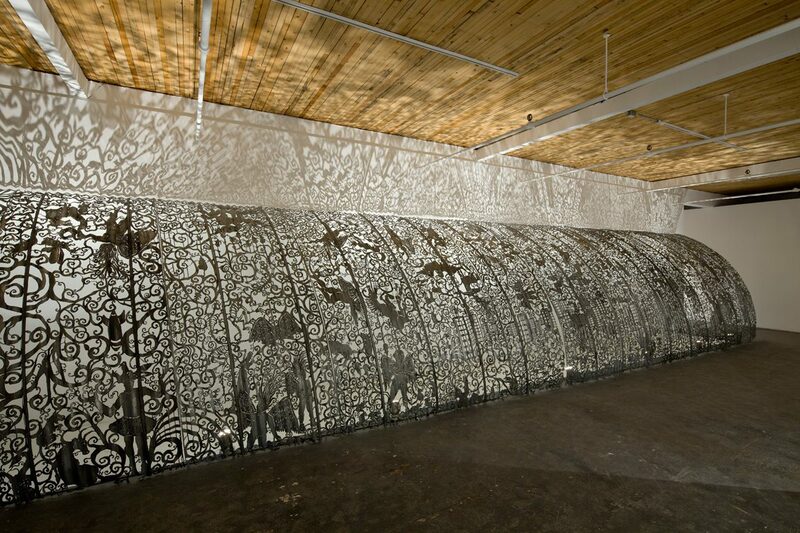 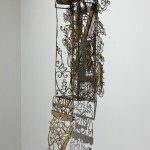 Gutter Snipes I (2011), a sewer pipe cut into a half-pipe, features juxtaposition between lace pattern and decorative scenes with mythological characters as the main actors in the carefully rendered sections. 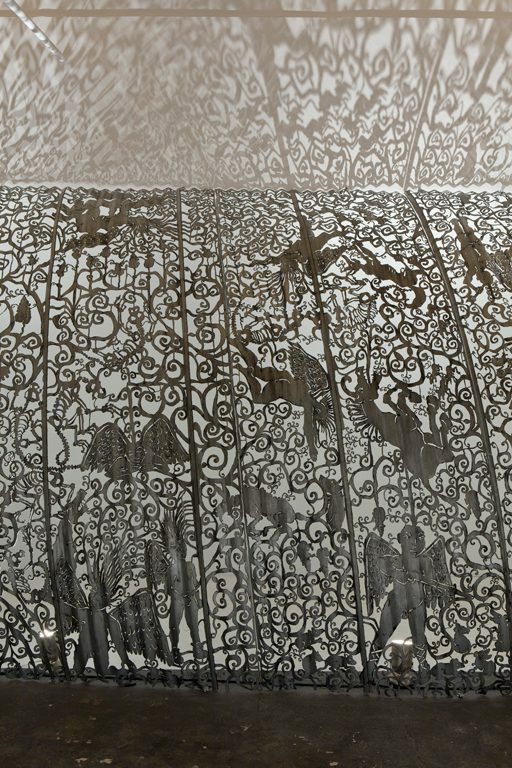 It is at this point in which the cold industrial utilitarian meet the intricacies of delicate patterned lace imagery for a rendezvous moment. 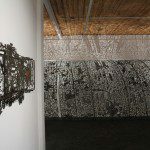 The delicate pattern of the lace does not obfuscate the underlying utilitarian nature of the steel sewer pipe, but merely connects the viewer to the apparent discord between the two materials. 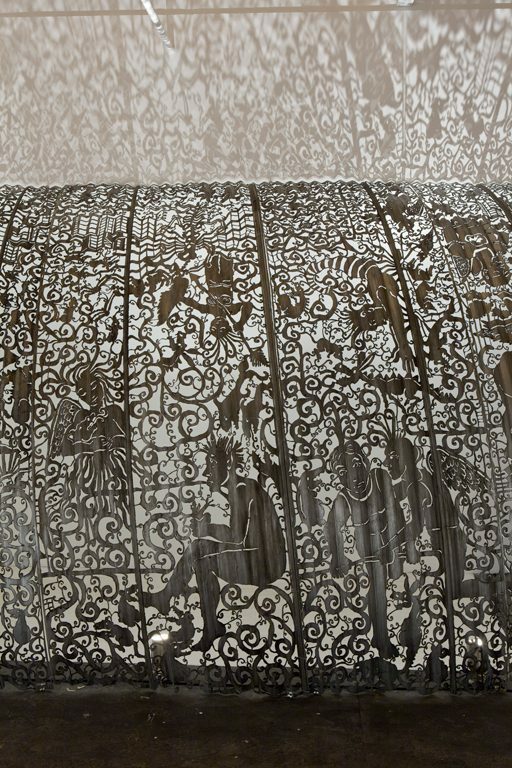 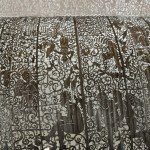 The lace offers a thin veil that acts as the binary between the apparent beauty of the rococo style pattern and the underlying less beautiful realities that lurk beneath, incongruous social structures, excess and indulgence. 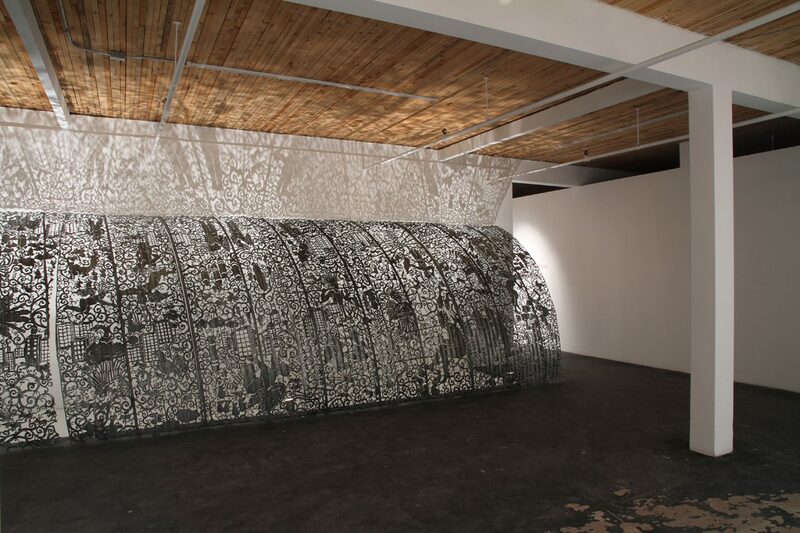 Comparing and contrasting is at the heart of Lane’s work. 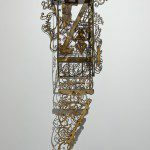 She creates the connections, but it is up to the viewer to take what they will. 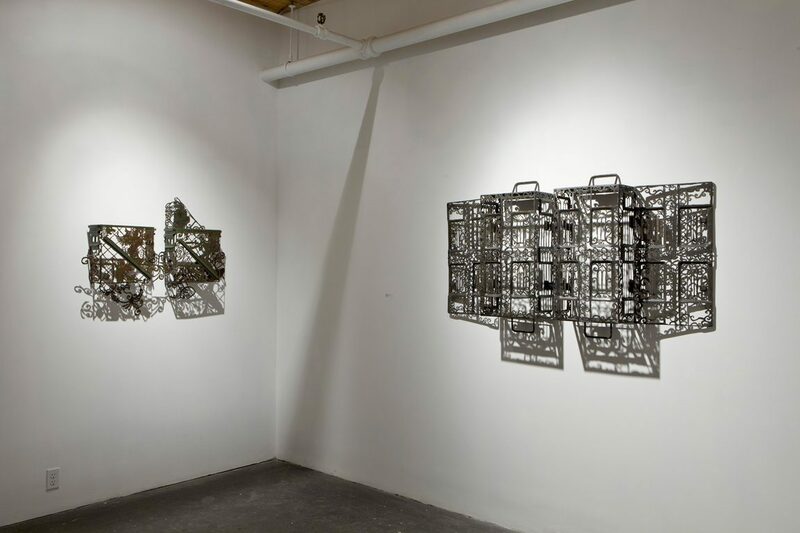 These works are conflicting, juxtaposing the beautiful with the cold, harsh nature of the metal. 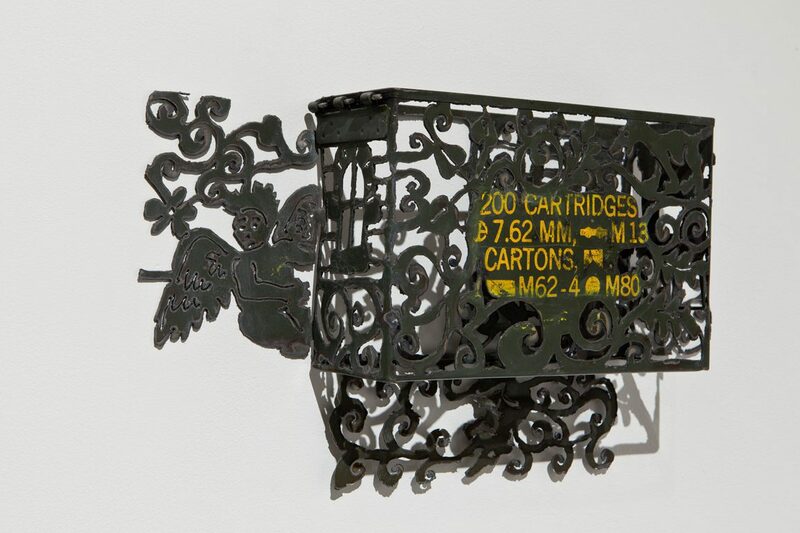 These two extremes are embodied in the Ammunition series and cause the viewer to consider the value society places on frivolity and excess and reflect on what the darker side to the realities of these desires might be.